Graduating Soon but Not Knowing What To Do Next? 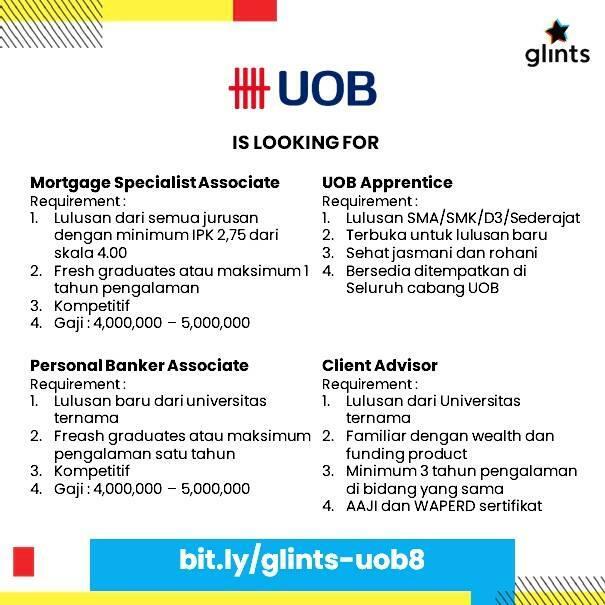 UOB Apprentice akan dididik dan dikembangkan untuk memiliki keterampilan bekerja terutama sebagai frontliner yang membantu memberikan pelayanan bagi nasabah dalam menanggapi kebutuhan pengelolaan finansialnya. • Significantly contribute to profit through product sales such as Savings, Time Deposit, Insurance, Investment. • Build good relationship with UOB customer and increase New To Bank customer. Client Advisors in the Privilege Banking. You will be proactively maintaining and managing customer relationships under Privilege Banking segment to meet monthly target, which includes AUM growth, CASA, New Customers and Product Penetration X-Sell (such as Bancassurance). Also you will need to ensure all sales processes are in accordance with Bank policies and procedures.